" FL GOP FIRES ROMNEY CONSULTANT'S VOTER REGISTRATION FIRM AFTER FRAUDULENT FORMS REPORTED IN PALM BEACH COUNTY	"
The Republican Party of Florida's top recipient of 2012 expenditures, a firm by the name of Strategic Allied Consulting, was just fired on Tuesday night, after more than 100 apparently fraudulent voter registration forms were discovered to have been turned in by the group to the Palm Beach County, FL Supervisor of Elections. 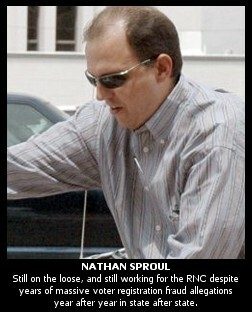 The firm appears to be another shell company of Nathan Sproul, a longtime, notorious Republican operative, hired year after year by GOP Presidential campaigns, despite being accused of shredding Democratic voter registration forms in a number of states over several past elections. According to the Center for Responsive Politics, Strategic Allied Consulting has been paid some $667,000 this year by the FL GOP, presumably to run its voter registration campaigns in the state. That number, however, does not account for another identical payment made in August. The Palm Beach Post is reporting tonight that the firm received "more than $1.3 million" from the Republican Party of Florida "to register new voters." The firm is not only tied to the FL GOP, but also to the Mitt Romney Campaign, which hired Sproul as a political consultant late last year, despite years of fraud allegations against his organizations in multiple states. Moreover, the firm is also reportedly operating similar voter registration operations on behalf of the Republican Party, to the tune of hundreds of thousands of dollars, in a number of key battleground states this year, including North Carolina, Virginia and Colorado. Strategic Allied has recently taken steps to hide their ownership by Sproul's notorious firm, Sproul & Associates. 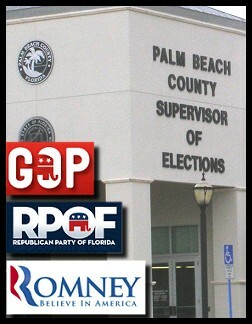 Palm Beach County Supervisor of Election Susan Bucher confirmed to The BRAD BLOG late this evening that she turned over 106 suspicious voter registration applications to the Florida State Attorney during a meeting yesterday afternoon in Palm Beach, after the "questionable" applications were submitted to her office by a worker for Strategic Allied. The forms were said to all have similar signatures, changed addresses and party affiliations, and other defects which appear to have all been done by the same hand. The case emerging in Florida tonight mirrors a similar incident reported earlier this year when more than a thousand fraudulent voter registration forms were discovered to have been turned in to the Sacramento County, CA Registrar of Voters by a group hired by that state's Republican Party. The Palm Beach Post reports tonight that Bucher turned the "questionable" applications over to FL State Attorney Peter Antonacci and Chief Assistant State Attorney Paul Zacks during a meeting on Monday in "an abundance of caution" after her staff "had questions about similar-looking signatures, missing information and wrong addresses on the forms." The paper reports that "some of the applications she questioned were for new voter registrations while others were for address or party affiliation changes or requests for new voter cards." According to the FL Election Code, the alteration of a "voter registration application...without the other person's knowledge and consent" is a third degree felony, punishable by a $5,000 fine and up to five years in jail. The Post reports that "The 106 applications flagged by Bucher were part of a batch of 304 turned in Sept. 5 by the contractor, using the Republican Party of Florida’s identification number." As of tonight, the Republican Party of Florida (RPOF) says they have fired the firm, which they claim they had hired at the request of the Republican National Party. "When we learned today about the instances of potential voter registration fraud that occurred in Palm Beach County," RPOF Director Mike Grissom said, "we immediately informed the Republican National Committee that we were terminating the contract with the voter registration vendor we hired at their request because there is no place for voter registration fraud in Florida." Palm Beach Post reports that Strategic Allied Consulting was given "identical payments of $667,598 in July and August" by the RPOF. 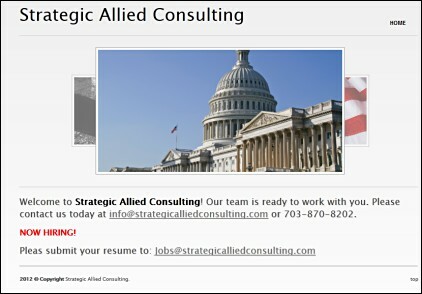 Strategic Allied Consulting, which has only a single-page, generic website (including typos, as seen above) has been advertising for paid registration workers on "Craigslist, Monster Jobs, Jobs Indeed, Conservative Jobs, etc.," according to a source who has been researching them over the past several days. Late last month, Greg Flynn at the North Carolina blog BlueNC reported on some of their job listings seeking workers in that swing-state, which Obama narrowly won in 2008, offering to pay anywhere from $11 to $13 per hour. "WANT TO HELP REPUBLICANS WIN IN NC?," reads one ad, "We are currently hiring self-motivated people to contact voters for the election. No experience needed! We are paying $13/per hour for this program." "Are you interested in helping Mitt Romney win North Carolina?," reads another, "I am with the North Carolina Republican Party working with Voter Registration Projects and am looking for team members to help expand Republican voter registration." "Republican Voter Registration Captains Needed," begins another, requesting applicants submit resumes to John Bria of Strategic Allied Consulting. "Help GOP candidates win in November and become an integral part a [sic] presidential campaign." "Employees will go to high traffic areas, identify conservative voters, ensure that their voter registration is up to date, and then report back at night with their data and the voter registration forms that they collected." Curiously, that's exactly what is seen in a rather breathtaking viral video we reported on this morning revealing a young voter registration worker in Colorado Springs, CO (El Paso County), asking a potential registrant, "Would you vote for Romney or Obama?" before she would offer a voter registration form. While the worker, when pressed, reluctantly admitted, "we're out here in support of Romney," she then claimed to be working for the El Paso County Clerk's office. In fact, as we reported, the El Paso County Republican Party Chairman has since admitted the young lady was working for the party. Following publication of our story, we were informed by a tipster that the young lady was actually hired by a third-party contractor, though we have not yet been able to either confirm that point, or identify the name of the contractor. BlueNC reports, however, that, in addition to FEC campaign filings showing the NC Republican Party paid some $333,000 to Strategic Allied Consulting for services in that state in July, "There is evidence that similar operations are being conducted in Colorado, Florida and Virginia on behalf of the Republican Party." Was the young worker in Colorado Springs hired by Strategic Allied Consulting for her work with the local GOP? The techniques described in the NC help wanted ads sound very familiar to what was seen on video tape in CO.
At BlueNC, Flynn reports "The company was set up in Virginia in June 2012 and filings with the Virginia Secretary of State reveal no identifying information other than that of a corporate filing service." He adds: "There is no evidence of business registration in either North Carolina, Colorado, or Florida (or Arizona)," where Sproul's Sproul & Associates is based. We've reported on Sproul many times over the years, as the GOP operative, and former chair of the Arizona GOP and the state's Christian Coalition, pops up again and again in each Presidential Election year. He is hired over and over by the Republican Party, despite years of fraud allegations in multiple states against his organizations, which are said to have routinely changed or entirely destroyed Democratic voter registrations. He operates as Sproul & Associates as well as Lincoln Strategy Group, among other names, including now, apparently, Strategic Allied Consulting. Republic Report reviewed disclosures from the Federal Elections Commission. Sproul’s Lincoln Strategy Group has received about $71,391 in payments for “field consulting” and “rent & utilities” by the Romney for President Inc. committee from November 30th through March 2nd of this year. John McCain's campaign has directed $175,000 to the firm of a Republican operative accused of massive voter registration fraud in several states. According to campaign finance records, a joint committee of the McCain-Palin campaign, the RNC and the California Republican Party, made a $175,000 payment to the group Lincoln Strategy in June for purposes of "registering voters." The managing partner of that firm is Nathan Sproul, a renowned GOP operative who has been investigated on multiple occasions for suppressing Democratic voter turnout, throwing away registration forms and even spearheading efforts to get Ralph Nader on ballots to hinder the Democratic ticket. That Sproul would come under the employment umbrella of the McCain campaign --- the Republican National Committee has also separately paid Lincoln Strategy at least $37,000 for voter registration efforts this cycle --- is not terribly surprising. Sproul, who has donated nearly $30,000 to McCain's campaign, has been in the good graces of GOP officials for the past decade despite charges of ethical and potentially legal wrongdoing. In Fang's report, he goes on to note that "Even former Rep. Chris Cannon (R-UT), during a hearing on voter fraud, admitted that 'the difference between ACORN and Sproul is that ACORN doesn't throw away or change registration documents after they have been filled out.'" As we described earlier today, in our story on the disturbing Colorado GOP voter registration worker video, while Republicans had long been critical of fraudulent voter registration efforts they inaccurately attributed to ACORN, the non-partisan, four-decade old community organizing group (which has since been forced into bankruptcy as a result of the years-long GOP effort to mischaracterize them and their work) there is no evidence, to our knowledge, that any of its tens of thousands of registration workers ever screened out potential registrants from one party or another before allowing them to register, as seen in CO. Neither is there evidence that any of their workers ever changed party affiliations on registration forms, as is being alleged tonight in Palm Beach County, or destroyed Democratic forms, as has been alleged over the years, as noted by Republican Rep. Cannon. Moreover, it should be noted that of the handful of ACORN registration workers who submitted fraudulent applications over the years, almost all of those workers were turned into officials by ACORN themselves. The group checked all applications for validity before turning them in, flagged those which appeared to be fraudulent, and then turned them in to officials, along with the names of the workers who had defrauded them. In 2006, GOP voter registration firms in California were reported by the LA Times to have turned in thousands of invalid registration forms, as well as fraudulent signatures on petitions in San Bernardino County. In once instance, "About 4,800 of more than 5,600 signatures submitted [by John Burkett Petition Management] were found to be invalid and were tossed out by election officials," the paper reported. In 2008, at the height of that year's GOP/Fox "News" ACORN "voter fraud" scam, a group calling itself Young Political Majors (YPM) was hired by the CA Republican Party to do voter registration. 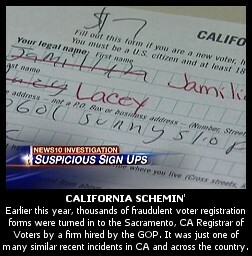 The firm was reportedly paid $7 to $12 for every Californian it registered as a member of the GOP. YPM was subsequently found to have been changing thousands of voter registration forms from Democratic to Republican. The group's CEO, Mark Anthony Jacoby, was eventually arrested (see video of my appearance announcing the news on Fox in a live "Fox News Alert" that year) before he later pleaded guilty to voter registration fraud. And, earlier this year, in 2012, the Sacramento Republican Party was found to have hired Momentum Political Services, a firm headed up by a woman described as a "professional con-artist". The group allegedly turned in thousands of fraudulent voter registrations as part of a $50,000 bounty scheme seeking Republican registrations, as paid for by the GOP in the district of Republican Congressman Dan Lungren. All the while, Republicans were loudly accusing Democrats of committing "voter fraud" requiring polling place Photo ID restrictions to stop it, even though there are just 10 known cases of in-person impersonation --- the only type of voter fraud that can possibly be deterred by Photo ID --- out of hundreds of millions of votes cast in all 50 states since 2000, according to a recent exhaustive report by the non-partisan investigative news consortium, News21. Perhaps it's a case of projection. Perhaps the GOP knows about the fraud that they are carrying out, so they presume that Democrats must be doing something similar. Nonetheless, when it comes to voter registration fraud, Republicans are the champs, hands down. And it remains to be seen how wide and how high this story will go. This one may have legs. As to actual voter fraud, it's Republicans --- and very high profile ones at that, including Mitt Romney himself --- who are winning that contest as well. See our recent report detailing 10+ recent cases of voter fraud and other related election fraud crimes by very high profile Republicans right here. « PREVIOUS STORY "Warren Misses Chance to Slam 'Independent' Source of Brown's 'Made Up Numbers'"
"FL GOP FIRES ROMNEY CONSULTANT'S VOTER REGISTRATION FIRM AFTER FRAUDULENT FORMS REPORTED IN PALM BEACH COUNTY"
The republicans doing business with crooks and scammers? *sigh* why isn't this guy under indictment somewhere? "we were terminating the contract with the voter registration vendor we hired at their request because there is no place for voter registration fraud in Florida." I have become so cynical that I read that sentence as they were disappointed they couldn't find a place in Florida to commit registration fraud. Got to chew an anti-acid tablet after that read. GWN - Hah! You may be right! Sproul isn't hired *in spite of* the fraud. He's hired *because of* the fraud. The Rs know that he's the guy they want. See Elizabeth Drew in NYRB: if they can't buy the election, they'll just steal it. Thanks for the shout out. I just got a call from a voting activist in Nevada who personally witnessed this in action in Las Vegas. She confronted the guy who said he was with "DNC" but only registering Republicans. She later fished a torn up form filled out by a Democrat from the trash and determined from elections board records that Strategic Allied Consulting was behind it. The GOP is one big hose job. No LinkedIn, also involved in what appears to be running a State of NC PAC for Tony Gurley, a NC Lt. Gov candidate; the PAC seems to be getting lots of "outside money"
it sure sounds like Strategic Allied Consulting is a key vendor for many of these states. Could someone explain whether registering by party affiliation is illegal (or just rude)? If illegal, what law makes it so? I believe the answer to your question @10, Randy D, would depend upon the laws in a particular state. For example, in Brad's earlier piece, there was a provision in a Colorado statute that prohibits those working for a voter registration organization from "displaying political preference or party alliance." In this case there was much more than "registering by party affiliation." There is an allegation that more than 100 registration forms had been fraudulently altered. Here, in CA, the issue people registering as Democrats only to either have their forms changed to Republican or thrown in the trash. Such actions are clearly illegal. Do you really expect anything better from the RepubliSKUNKS and the Transylvania tea baggers. Kick the right wing extremist and thieves out of Washington. A woman in front of the main library in Denver asked me who I was voting for. When I told her Obama she made a mark. I asked her if she was registering voters and she said she was, although she did not offer that service to me. When I asked her who she was working for, she said she didn't know and gave me a vague location in the next town. The obvious comparisons to the GOP rage against ACORN have yet to materialize. The obvious differences, such as no "sting" was involved, and the accused company has "only" voter registration as a purpose with no redeeming social benefits, and that it obviously was only concerned as a "for profit" venture with registering voters for it's client, have also remained untouched, even by the "liberal" media. Surely this is just delayed reaction and not some attempt to form public opinion. Right? If Dems manage to retake control of congress and the White House in Nov one of their first priorities should be a voter rights initiative that cleans up the sewer that Republicans have made of the election process in too many states. The GOP would rail against such legislation, but they have created a continual cacophony of ridiculous complaints sufficient to bury the wailing in the background noise everyone expects of them now anyway. just like the republicans to blame others for what they are doeing. Everything that I have red today about the republicans today seems counter to what they believe. The Bible speaks of their comeing. it calls them the great deceiver.